I started LoveSick right before the end of the year because I wanted to read a book I was fairly certain would not become a favorite and miss out on my favorite books of the year list. I know it's wrong to head into a book with so much prejudice, but in this case it actually worked because I enjoyed it much much more than I thought I would*. 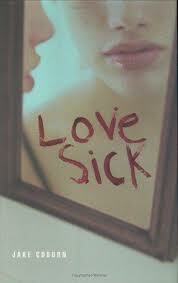 LoveSick is about two young college students who each have a huge demon they are battling in the form of an addiction. Ted is a recovering alcoholic. His alcoholism led to a drunk driving accident that ruined his life via an injury that would keep him from a basketball scholarship. Erica is a wealthy girl who is battling bulimia. Her father is very controlling and when Erica insists on going to college on her own, he devises a plan to hire someone to keep an eye on her and make sure she doesn't return to binging and purging. He hires a private consultant who locates Ted and offers to pay his way to college completely in exchange for keeping an eye on Erica. Ideally the situation shouldn't require Ted to do much except look for alarming signs that Erica is relapsing, and in exchange, he'll be able to attend college after all. I'm pretty sure you can guess where the story is going. Ted goes to school but soon finds himself in a surprising friendship with Erica. And he feels more for her than friendship. He starts to feel guilt ridden about what he's doing. And Erica really likes Ted, too, she likes him more than she's ever liked anyone. After this is established, the story escalates in ways that feel REALLY BIG for the quieter story it felt like before. I guess I can understand the reasoning behind it, but to be honest it was my least favorite part of the book. Still, when you are messing around with big money, bad things are bound to happen. "Erica skipped hurriedly past his eyeline and then paused outside the door to the bathroom. She couldn't decide if she was embarrassed by her messy ponytail, or her swollen pores, but she suddenly felt like turning into the bathroom and meticulously inspecting herself." (She spends some time then trying to figure out what to do and talking herself into the fact that only she has a right to judge herself when..."Ten feet from the lounge, Erica realized she'd instinctively refastened her ponytail, and it infuriated her. Reaching again for the elastic, she yanked it from her hair. Erica continues to meet her therapist from home, but because she doesn't trust him quite yet, or her father, she meets him in online chess games to chat about her life. The therapist is really endearing, but I loved how she described Ted to him at first, and how she didn't want the things Ted had done to be what defined him to anyone else. DrMTRudas: Then how would you describe the 'real' Ted to me? DrMTRudas: I think that's a contradiction in terms, Erica. I also really liked Ted and his struggle with the morality of what he was doing and his growing feelings for Erica. I never doubted that he wanted the best for Erica, but at the same time this money they were giving him represented his last real chance. His roommate drinks a lot, and Ted is never unaware of the temptation. He even thinks to himself that he could outdrink him, when his roommate looks down on him for not partying like everyone else. His emails with the private consultant who hired him are hilarious and reveal his level of discomfort with what's he's doing. To be clear, when the truth comes out Ted faces the consequences of his actions. Ted and Erica don't save each other, the narrative holds that change can only happen when the individual is ready. But they do provide friendship and understanding for each other in a time when they don't have it anywhere else. So while the plot is not all that original, I enjoyed LoveSick for the characters and the realistic depiction of their addictions. *Jake Coburn writes for Gossip Girl and I never like his episodes they often include problematic elements and are sometimes offensive. I do not understand how the person that wrote the LoveSick characters gets the Gossip Girl characters and their issues so wrong though. Also, he's a recovering addict himself according to his website.